I’ve left this blog in cobwebs for awhile, but it’d be remiss if I didn’t dedicate a post to the person who inspired me to explore the nuances of foods and cultures. It’s obvious to those who know me how much Anthony Bourdain meant to my passion for food and travel. And I’m not alone. The outpouring of love and grief since his passing last week still reverberates. His genuine, witty, deadpan humor and the way he embraced people and their cultures can be seen and felt with every episode, no matter what network. He wasn’t afraid to speak his mind and that’s what made him endearing. He had a way with words on screen and on paper, penning some great books that I know have recently topped the bestseller list on Amazon again since his untimely passing. It’s painful to think of what demons he had been trying to overcome, but I hope he has found peace and that his ashes get sprinkled in the country he so loved, Vietnam. Truthfully, I don’t remember what happened much in this episode. Tony goes on some crazy adventure to hunt seals with the local Inuits in Quebec (I’m sure PETA was up in arms about that one). But what stood out to me most in this episode was when he sat in the kitchen with the locals who had just caught a seal. They were dividing up the meat for the family meal — a feast! The elderly grandma smiled and offered Tony, as their honored guest, the most precious part of the seal, to them — the eyeball. And Tony graciously took it. He knew what it meant to those people to offer him their best, and he ate the eyeball without qualms. I can’t remember how many times I’ve watched this episode, but I loved the juxtaposition of Tony’s stoic “just give me a beer” character with Nari, the Korean intern who coaxed Tony to experience her motherland with her. I love all things Korean, and it was hilarious to see Tony try to immerse himself into the Korean culture — making kimchi, going to the sauna, eating sannakji, and being dragged to a norebang (karaoke — Tony’s personal hell). Season 2 of No Reservations was a particularly fruitful season for the show (all my favorite NR episodes just so happened to be from this season). This episode actually didn’t explore much of Beirut, as the crew was trapped inside a hotel, shielding themselves from warfare. But this is where we ultimately see Tony cook again and turn to food and cooking in times where everyone needed comfort. I loved seeing that side of him and the behind the scenes as the crew basically fled back to the States. This episode literally hit home. How excited was I to see my hometown featured as the second episode on Tony’s latest show? While Tony’s since visited LA many times, I love this episode because he keeps it real and visits Koreatown — my neighborhood when I last lived there. He sits down with David Choe and talks about things that are very real for those of us growing up as children of immigrants in LA. He and Roy Choi of Kogi BBQ discuss the LA riots, which I also lived through. While Tony has visited Thailand many times, I recall receiving so many messages from friends alerting me to this episode. Tony visits Northern Thailand, where I spent a brief period of my time in college studying Thai (the irony — I’m fluent in Thai), but really daydreaming of what to eat each day. This is the episode where I’m introduced to Andy Ricker, whose command of the Thai language as well as Northern Thai foods never ceases to amaze me (visit Pok Pok in Portland and you’d agree). I loved that Tony resurrected memories of Chiang Mai for me and even introduced me to new places that I had the opportunity to try on my last visit to the city. Thank you, Anthony Bourdain, for igniting that love of food and travel in so many of us. You’ve left an indelible mark on how I want to experience the world, as I’m sure you’ve done for many. What do you do when you can’t find just the right sauce to complement your dish? You make it. That’s exactly how Huy Fong’s Sriracha was born. Fun fact: the lesser known, but eponymous Sriracha is actually a Thai sauce, sweeter than Huy Fong’s and originating from the town of Sri Racha in Thailand. 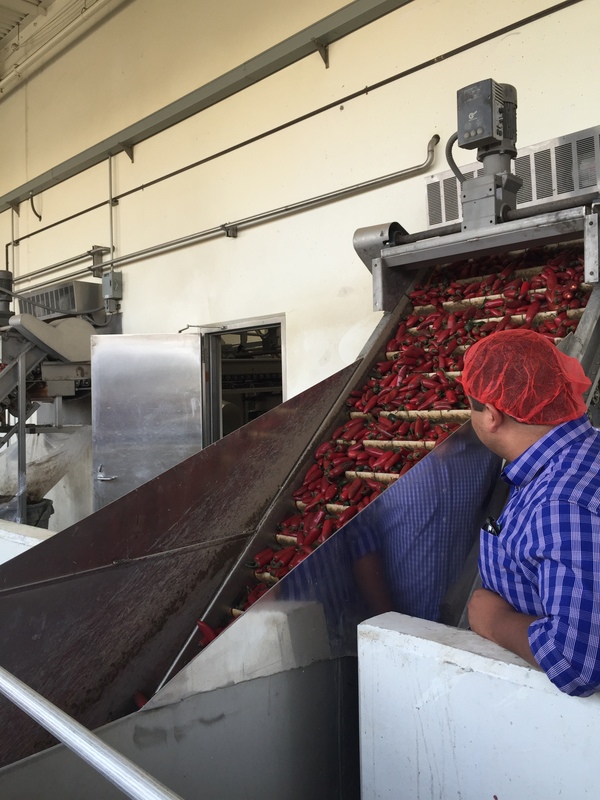 Last month, I toured the Huy Fong factory in Southern California during the last day of the chili grinding season. 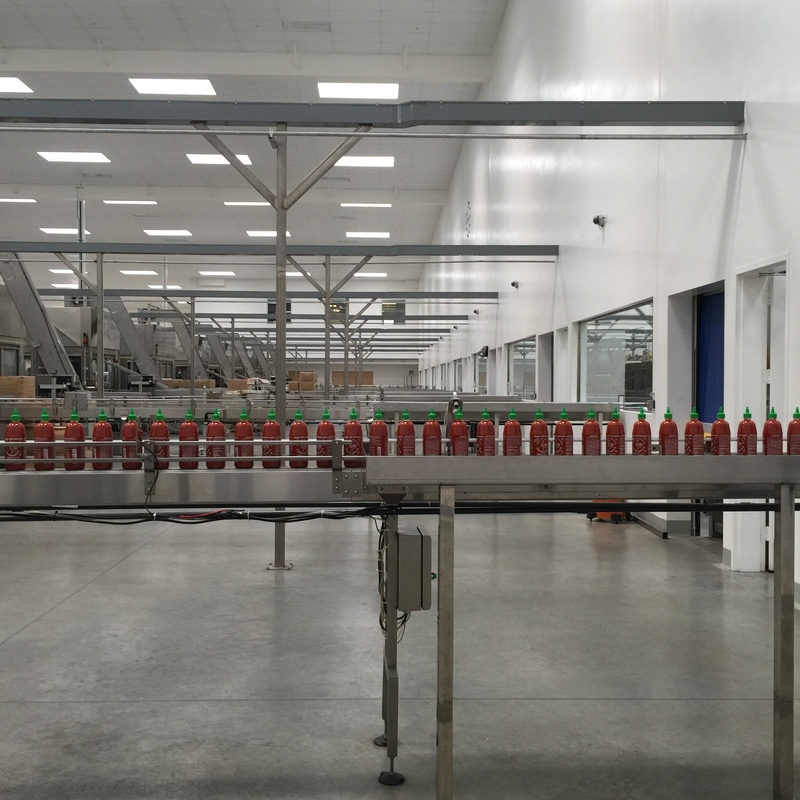 Huy Fong Foods actually makes three sauces in their shiny new, state-of-the-art factory: the famous Sriracha sauce: Sambal Olek, a more pasty chili vinegar sauce; and their chili garlic sauce. Conveniently, they’re all made from the same few ingredients, so harvesting and grinding the chili each season covers all three products. One of the last truckloads of chili coming in from Underwood Ranches. Apart from owner David Tran’s humbleness, the other thing I admire most is his use of local ingredients to make this Asian staple truly American. The chilis are trucked in from Underwood Ranches, which has locations in Southern and Central California, and the garlic is from Gilroy, California, the self-proclaimed garlic capital. Chili avalanche. What photos don’t capture: folks sneezing and coughing. 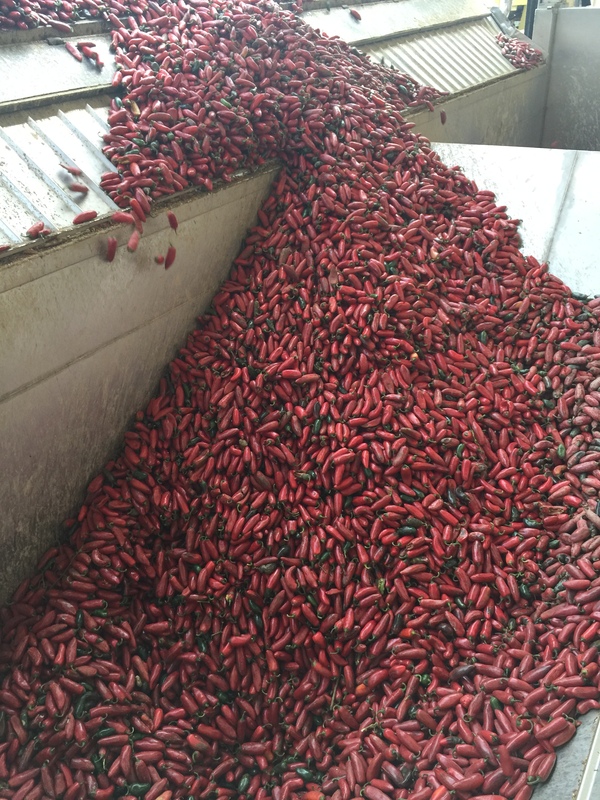 Chilis getting cleaned and selected after they avalanche in from the truck. The tour of the factory itself can actually be booked year round. 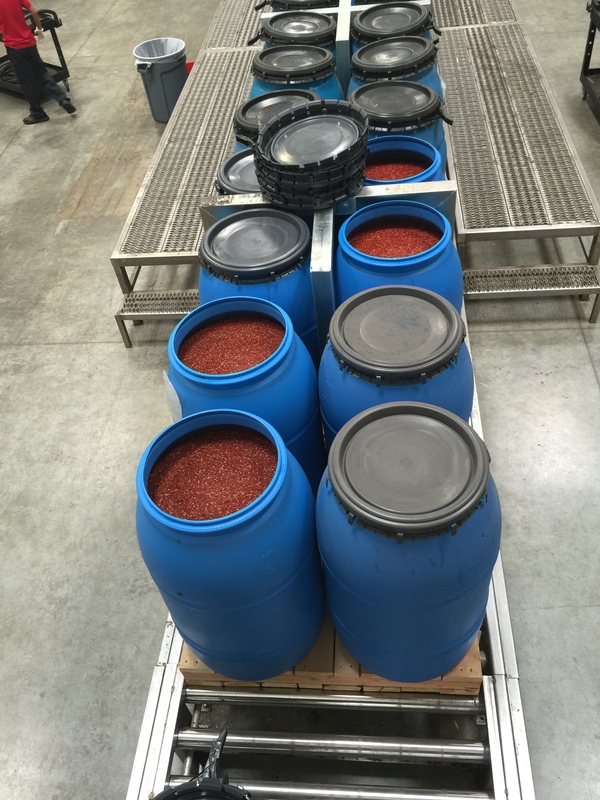 What’s special was watching the trucks of chili roll in and get selected, crushed and packaged into the blue bins. Another surprising fact I discovered on this tour was even the Sriracha bottles were made in this factory, so the labels can be screen printed right onto the bottle. Having been inside much smaller foods factories, it was amazing to me how automated everything was here, from the chili selection, to the bottle making and packing of the bottles. Sriracha bottles, marching to the boxing station. The tour ended with a sampling of various items made with the famous sauce. While Tran knows his famous sauce has peak popularity, he doesn’t hold back those who get creative with it. In fact, Huy Fong embraces it in their Rooster Room, with souvenirs and snack creations ready for purchase. 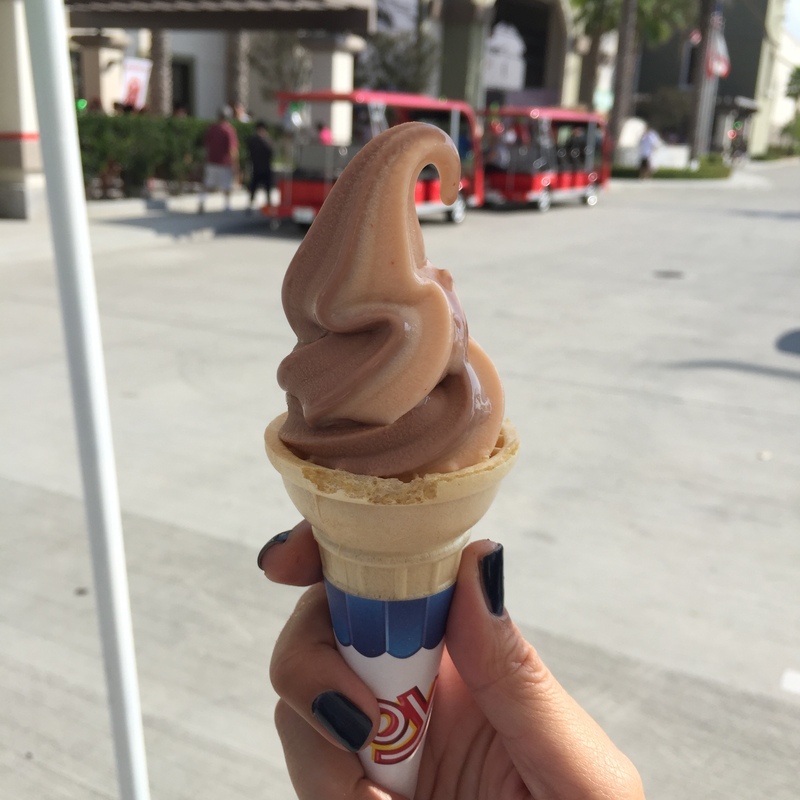 Sriracha ice cream, handed out from an ice cream truck on the grounds of the factory. Watch the documentary to learn more about this epic sauce! I finally made it to Kin Khao (which literally means “eat rice” – a term Thais use to say “let’s eat”) two weekends ago. I really didn’t know what to expect. I was anticipating traditional Thai flavors that K. Pim frequently mentions, but also playful explorations on Thai dishes. After a truthfully lackluster meal at the highly hyped Night + Market in Los Angeles, I braced myself, but went in with an empty stomach and an open mind. Kin Khao is adjacent to the Parc 55 in Union Square, a somewhat hidden location, but almost fitting to me in that it reminded me of restaurants adjacent to/ in hotels in Bangkok. The decor is modern, with hints of kitschy Thai memorabilia that delighted my husband and our friend. Each table had a tray with chopsticks in an old pepper tin (vintage, cute! ), forks and spoons (the proper Thai way to eat – not with chopsticks as many tend to think), cloth napkins, and the original Sriracha, from the town of Sriracha itself. I’m not talking the rooster from California (although a favorite in my household, too). This is the original for which Huy Fong’s creation was based off of. And it’s extremely hard to find in the Bay Area. The serving trays are stainless steel/tin with floral designs, reminiscent of the ones used each morning when taking packaged foods out to the front of the house to give alms to monks coming by. I loved the little details of home at this place. Next, some small bites. Left is my friend’s favorite dish growing up, Yum Kai Dao, or Fried Egg Salad. It’s a simple dish, when done right, brings out flavors of home. I thought this was tasty, and especially appreciated the high quality eggs, but it wasn’t my favorite of this bunch. 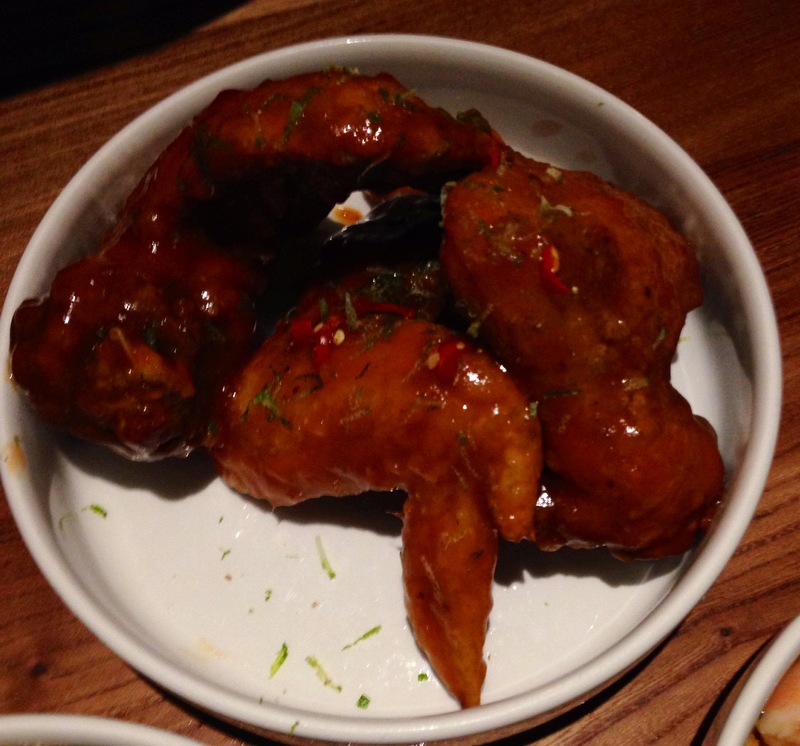 The Pretty Hot Wings, right, were also very tasty. They definitely had a kick and I loved the tamarind flavor in them. And, as crazy as it sounds, they were even tastier with more Sriracha to dip! 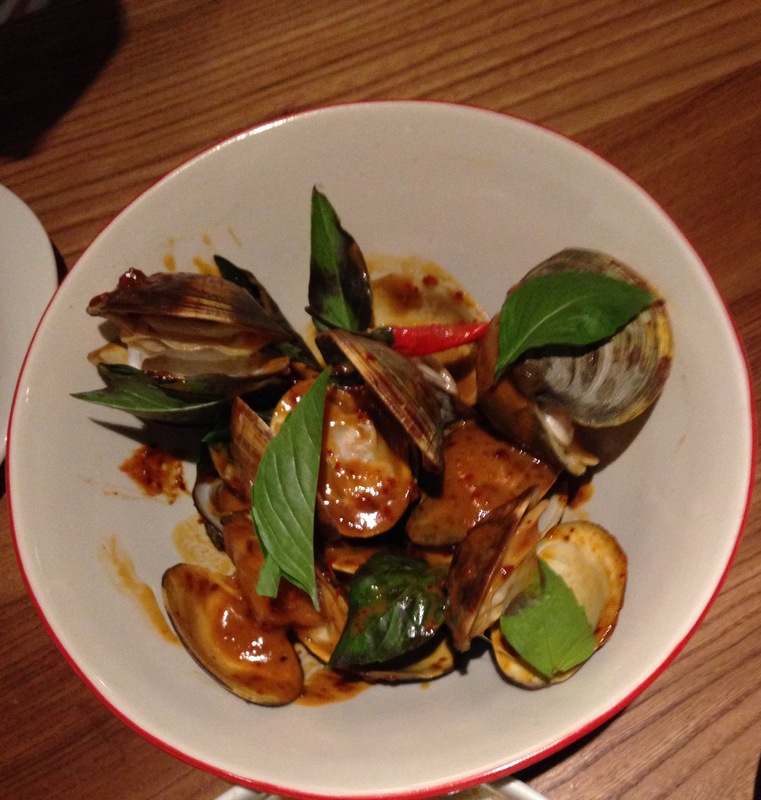 I was really looking forward to trying the chili jam clams, and they didn’t disappoint. They were sweeter than I imagined, but I am also accustomed to the bottled chili jams. What I appreciated most about these were the size of these babies that you would not get at any mom n pop Thai restaurant. These clams rivaled those I purchased for my Asari Shio Ramen I made in the fall. They were huge! The Khun Yai’s Green Curry with Rabbit was also an interesting take on your traditional green curry. The curry flavors didn’t stand out as much as I had hoped — definitely heavier on the coconut milk side, but the rabbit meatballs were so tasty, and the rabbit meat was not gamey at all. I imagine the second day for this curry as a leftover would have more intense flavors, as curries only get better the longer you keep. I’m disappointed I don’t have a photo of the Kua Kling Ribs because they are my husband’s favorite, and the item he ordered again on our second time at Kin Khao. The flavors of the rib tasted like the curry was really homemade — like chopped and pounded with mortar and pestle with love to create this dish. I’ve had this traditional southern Thai dish in many places (including Night + Market and authentic Kua Kling in southern Thailand), and this was pretty close to what I remember eating in Thailand. It wasn’t too soggy, and like many curries. was even more intense as a second meal (as proven by my dinner the following day). 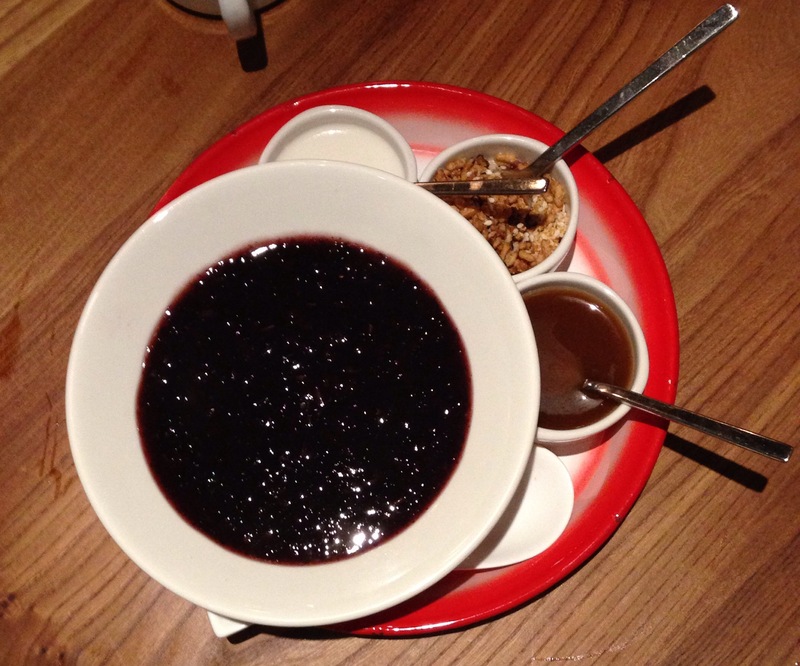 We ended that night trying the dessert on the menu, the Black Rice Pudding Dessert. The first thing I appreciated about this dessert was that she calls it what it is in Thai: Black Rice. It ain’t forbidden – it’s my favorite type of rice. The texture of black rice is a bit heartier, much like brown rice. It’s served paired with coconut milk (a must!) and caramelized palm sugar (yum – so rare), as well as crispy rice flakes. Last weekend when we visited again, my husband lamented that he really wanted to have this again, but we were sadly too full. 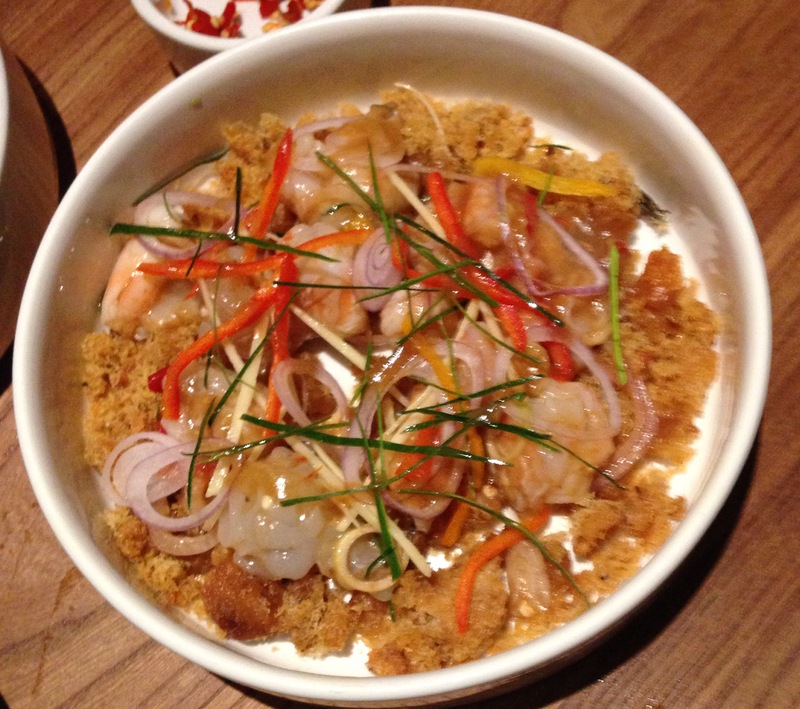 Our second visit to Kin Khao was primarily to catch the Crab Sen Jan noodles before crab season was over. When we arrived, K. Pim sadly reported that they had already ran out of crab for the season (sad face) but not to fear, she had something else for us to try. We ordered our favorites: the Saeng-wah Salad and Kua Kling Ribs, and also tried two new items: The Mushroom Hor Mok and Sai Ua + Nam Prik Noom. The Mushroom Hor Mok is a vegetarian take on another traditional Thai dish, made by steaming a paste mixture of fish, coconut milk and curry. I’ve helped my mom make this dish growing up, and remember tasting it raw (and having her chastise me for sticking my finger in the batter). 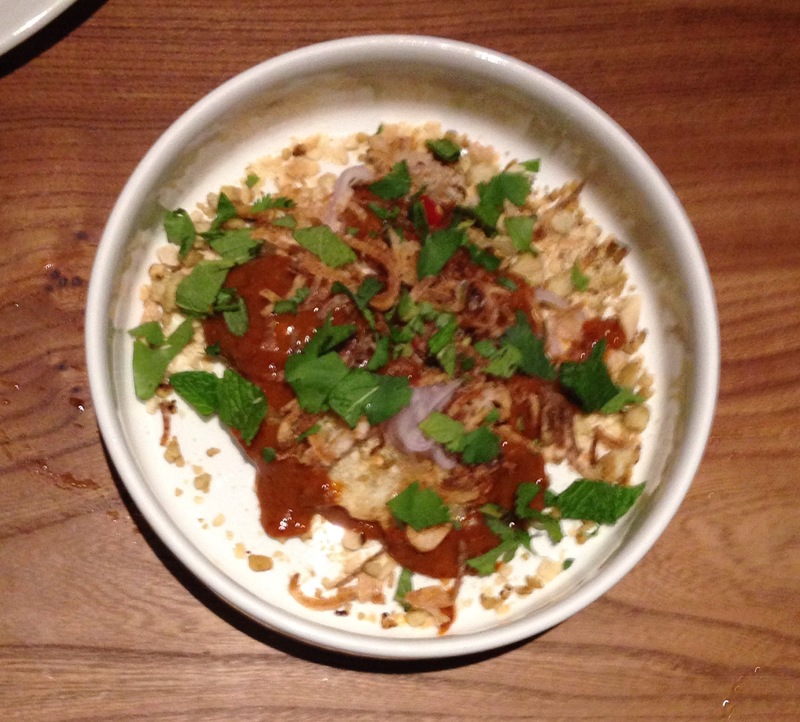 K. Pim’s version of this dish goes the vegetarian route, and combines another Thai favorite, khao tung. A traditional Thai snack/small bites dish, khao tung, the rice crackers seen here, are eaten with a savory mixture of coconut milk, peanuts, caramelized onions and ground pork. The hor mok is served in a pot de creme style, eaten with the khao tung (it’s normally eaten with regular rice). This was definitely an interesting flavor for me, again, not as intense as a curry, but there was something addictive about the mushroom version. K. Pim explained that they used agar agar (ผงวุ้น in Thai) to thicken the hor mok, since it was vegetarian and the properties that fish provided to the paste could not be achieved. I thought that was so amazing, because I didn’t notice a difference in the texture very much at all. And, like the rest of the curries I tried, the flavors became even more intense on the 2nd-3rd day of this hor mok’s life — delicious! Moving on to the northern region of Thailand, another dish I was keen on trying was the Sai Ua + Nam Prik Noom. Sai Ua is the sausage, pictured below, made with similar flavors as the Kua Kling (although North and South, we realized the flavors were very similar). The intensity of the herbs comes from the kaffir lime leaves. 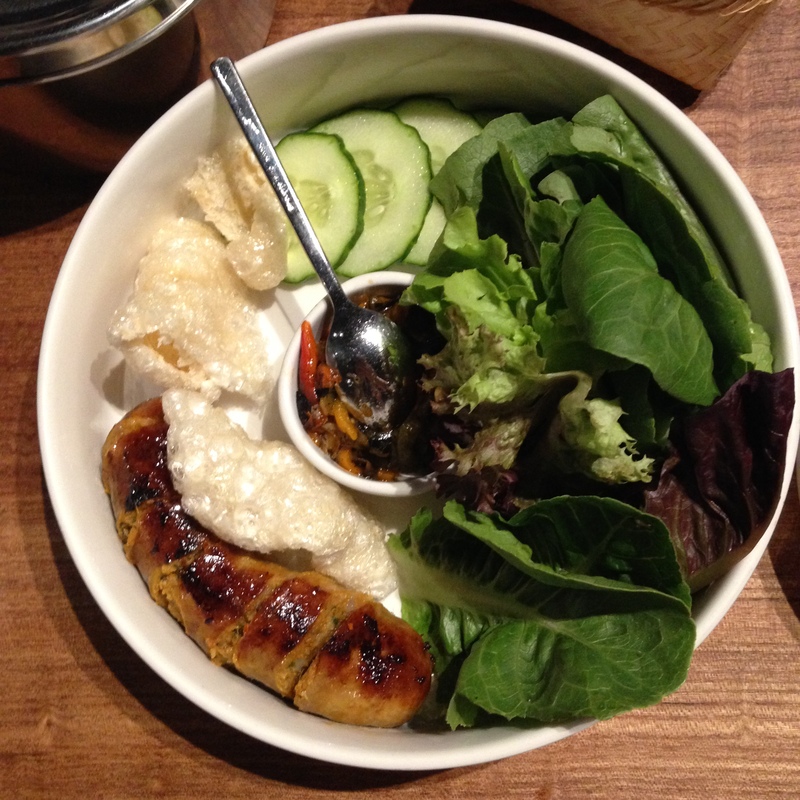 It’s served paired with another northern favorite, Nam Prik Noom. Traditionally, this is a bright green chili paste made from green peppers finely minced. K. Pim creates a more salsa-like version here with roasted peppers, which give it a unique, albeit still intense flavor. It’s also served paired with homemade chiccarones (need I say more?) and quality, fresh vegetables. I’ve never had butter lettuce with nam prik noom, so I couldn’t stop munching on that! The last item was truly my Ratatouille moment — the dish K. Pim said was a surprise. I have not seen it on the menu yet, so I feel very blessed and fortunate she made it for us! It was a dry version of a chili paste, dry fried with deep fried kaffir lime leaves. Pla Duk Foo Prik King — basically taking the crispy catfish and frying it with the traditional prik king paste. 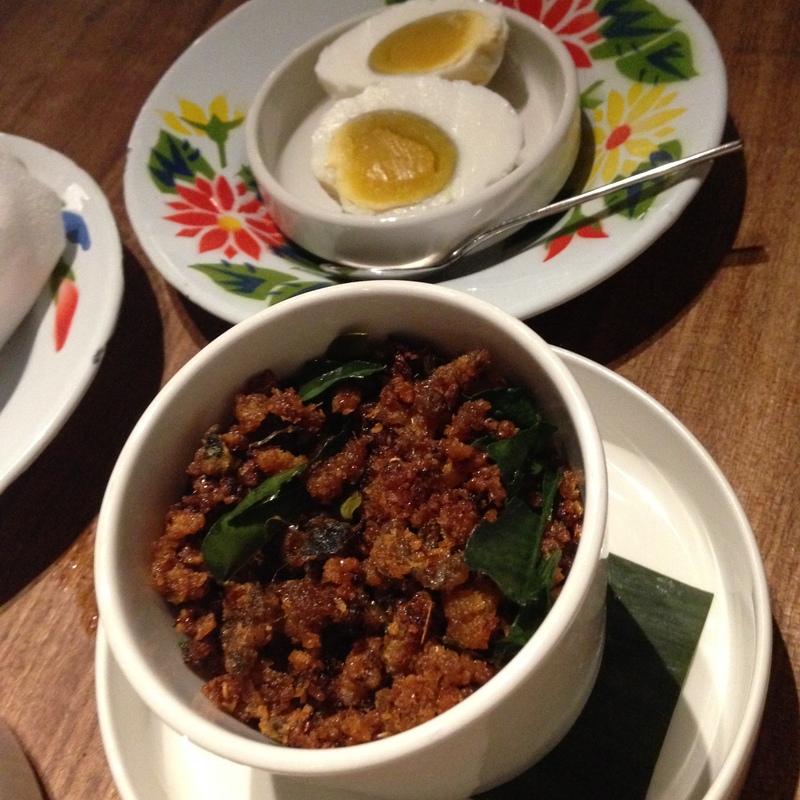 Most chili pastes are eaten paired with salted eggs, so K. Pim brought some of that over, too. We could tell they were homemade — the consistently and level of saltiness reminded me of my mother’s precision in timing how long she wanted to salt eggs. Store bought salted eggs are often too salty and lose the right consistency in the egg yolks. These were perfect. And it all tasted like home. Moreso because I had a similar bottle of this prik king at home from my mother. K. Pim’s version was meatier and sweeter and I nearly shed tears of joy when I ate this all paired together over rice (I really was that happy). 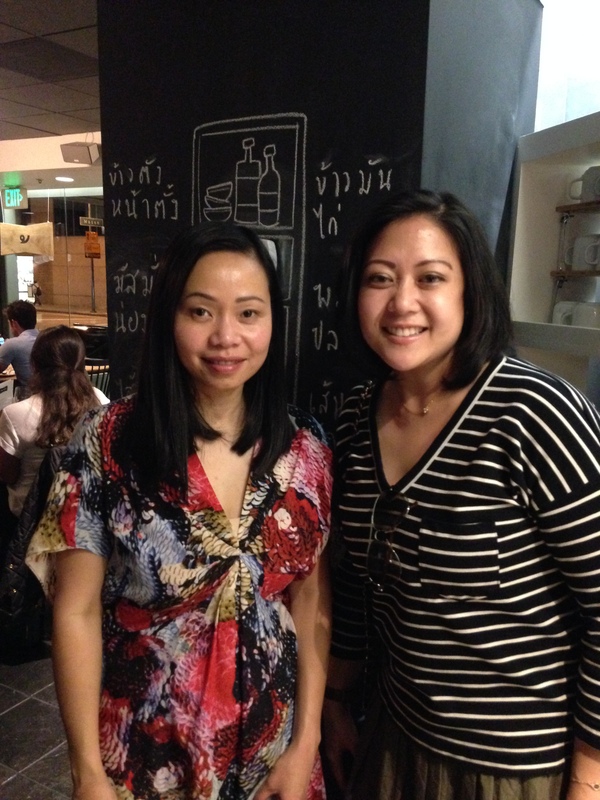 Thanks to K. Pim for delectable experiences at Kin Khao, complete with the Thai hospitality. I can’t wait to come back! 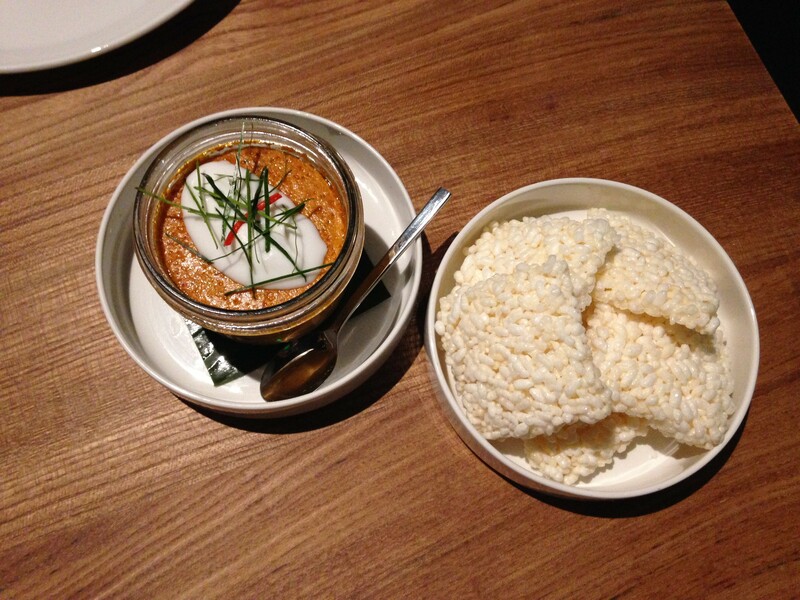 My husband describes it best when he says Kin Khao isn’t your average Thai place in the States, which seeks to mimic the down-home-comfort flavors at a simple, family-style restaurant (and not to say I don’t love those!). As a Bangkokian (? ), Kin Khao is that place you’d go on a Friday night with friends — the hip new place that’s reimagined the flavors you grew up with into something magical. I’ve always really loved noodles, but my go-to Japanese noodle has been the ramen (more on that later). During my trip to Paris, while I picked up French words and phrases I used throughout my days there shopping and dining, I found it a bit trippy to be in a Japanese restaurant in France. My language association with Japanese restaurants has always been Japanese, of course, and English, having been to Japanese restaurants mainly in the states. So when we walked into Sanukiya after a laborious shopping day on St. Honore, it felt a little odd to still hear merci. My Japanese might be a little better than my French, when it comes to food and living, so it was almost easier to use Japanese words (and hand gestures) to communicate. At any rate, Sanukiya did not disappoint (as my friend Jackie rarely does). One of the distinct things about Japanese food and culture is the meticulous time and dedication that’s taken to prepare and present a meal, even a bowl of noodles. The same can be said for French food, which is why the mutual love of Japanese and French does not surprise me. 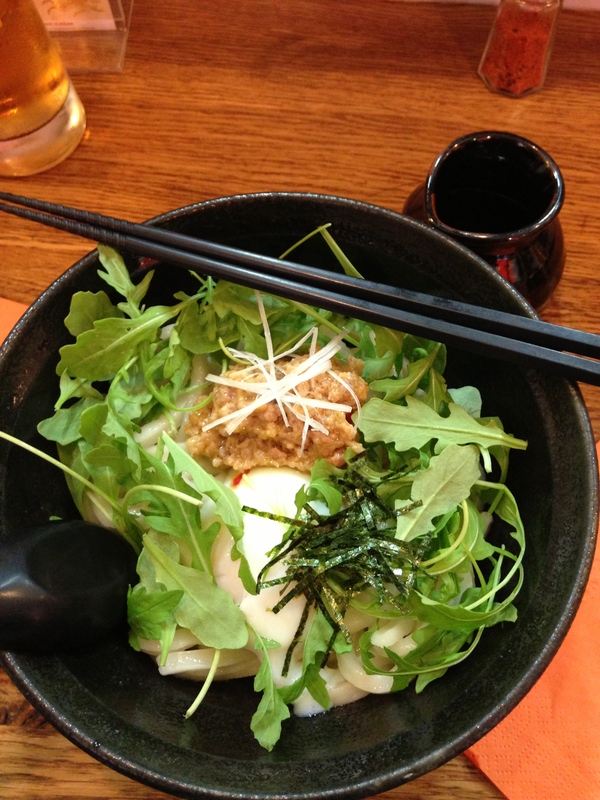 What I’m getting at is the presentation and amazing tastes that came from the bowl of kakkemiso udon in Paris. The noodles were perfectly al dente, served with a light shoyu/dashi broth, arugula (or rocket, as my Thai brethren call it), the most amazing flavorful pork I’ve ever had, and of course, the piece de resistance of any good bowl of Japanese noodles (as David Chang will tell you), a perfectly soft poached egg. The combination of egg, noodle, pork flavors and the surprising arugula has left me craving this dish intermittently since we’ve returned from Paris. Along with this remarkable creation was also a frozen beer. Eat your heart out, Homer Simpson. 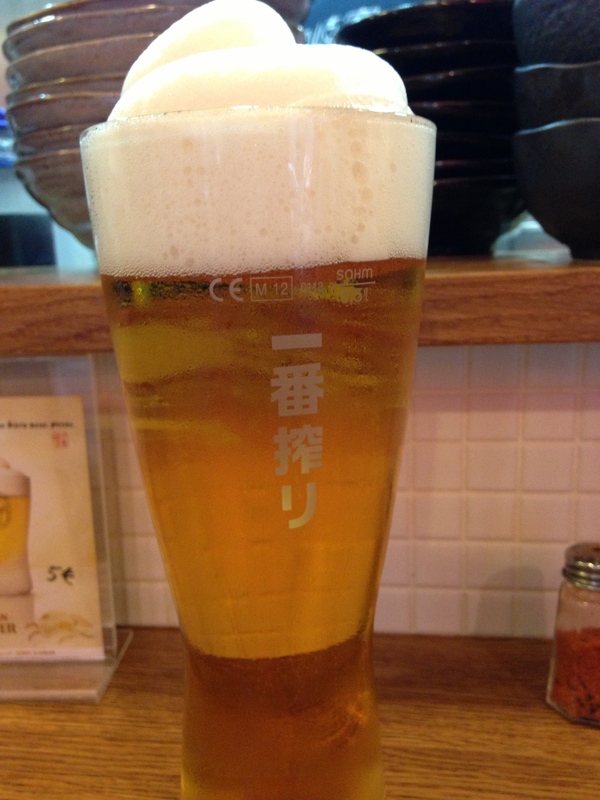 This was a draft Japanese beer, frozen to a slurpee-like consistency that ensured a cold beverage until the last drop. That day, I left St. Honore feeling full and satisfied, as any great meal should leave you.